One who does not know where he or she comes from can never know where he or she is going. Likewise, he or she who is ignorant of yesterday can never do well tomorrow. Every Yoruba or Hausa child you ask about his origin will tell you about Oduduwa and Abuyazid respectively, and also tell you where they migrated from. On the contrary, an Igbo man or woman will know who colonized America, where the people came from but is ignorant of the origin of the Igbo people. Worst of all, our so-called great historians are yet to reach agreement on the origins of the Igbo people. Some of them even went as far as accepting the white man’s distortion of Igbo spellings like Awkuzu (Okuzu), Onitsha (Onicha) etc. Our people are not yet ready to sit up and work. This attitude has led to three different schools of thought as regards the Igbo origin. One school upholds the Igbo homeland hypothesis. They maintained that the areas identified as the primary core of the Igboland comprises Nri-Oka, Olu, Owerre and parts of Okigwe. They claim that it was from the heartland mentioned above that different people migrated to various present day Igbo. It is unfortunate that the Aro people subscribe to this view. They forget that what we have is the “Eri-aka in Aguleri till date and not Nri-oka. They also forget that the Aro were unknown in history until the era of the Atlantic slave trade due to the regrettable role they played as middlemen. According to Idigo A.C., the Aro claim to have been founded in a meeting place between the Igbo and the Ibibio. If the Aro was founded at a meeting place between the Igbo and the Ibibio, it then means that the Igbo nation already exist before the emergence of the Aro. Surely, no son begets the first son before his father. Another school of thought traces Igbo origins to the Niger/Benue confluence. In other words the Igbo migrated from the said area. 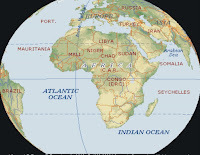 The attribution of Igbo origin to this area is mainly based on the linguistic theory that all who use the kwa language like the Igbo, Yoruba, Idoma etc are from the same area. This theory is no longer tenable. In fact it is dying gradually. A third and probably the most popular school of thought is that which holds the Eastern hypothesis which suggests that the Igbo people migrated from the East. They identify the lost tribe of Israel with the Igbo people. Thus Ezeala, J.O.C. Asserts that “the Igbo are a section of the tribe of Juda who in 718 B.C. left Israel when idolatory was imposed on the Israelites by king Salmauazar of Assyria. They left for unknown destination in search of a place to worship the One, True, Holy God and in 638B.C. Arrived in this part of Nigeria where we now live”. As recently as October 10, 1995 some Israeli officials paid a two-day visit to the ancient town of Aguleri in search of the lost tribe of Israel (Eri) who was supposed to be the fifth son of Gad, the son of Jacob. These visitors were taken round the town. They said that most of our customs and the names of certain monuments were similar to theirs. Special mention was made of the Obuga in Aguleri which they have and called Obugad in Israel. This is a place built by Eri in order to immortalize the name of his father Gad. This palace is in Aguleri till date. 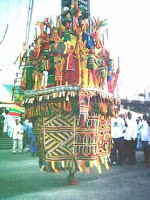 You can visit Aguleri during the greatest festival in Aguleri called Ovala. This visit made by the people of Israel added credence to the above school. The Ndigbo therefore are the Jews in diaspora. The children of Nsugbe, Igbariam, Amanuke and Nteje also migrated to their present sites. Agulu got married and had three sons namely Anumagana, Ezunnukwu and Ezi. Their offspring inhabited present day Aguleri. Aguleri is one of the largest town in the old Anambra State, situated at the bank of the river Omabala (Anambra), about 32 kilometres by the shortest land route to Onitsha. The land is low lying. In the rainy season, the Omabala floods its banks to the extent of many kilometers depositing alluvial soil resulting in the great fertility of the soil. The climate is hot and has its hottest period in the month of March while the coldest in December. The heaviest rainfall occurs in the months of June and early July. The vegetation is well distributed along the Omabala river, other streams and lakes thus make available to the town tall gigantic trees which supply sticks for building houses, farming and fuel for cooking. Apart from the above, there are tall coarse grass that are found in the town. It is then not surprising that big animals like monkeys and snakes roam in the forest while antelopes and cutting-grass which are preyed upon by stronger animals inhabit the grassland, for instance, during the flood of 1994, an elephant was killed in Aguleri. Aguleri people are farmers, hunters and fishermen. They cultivate in great quantities crops like yam, cassava, maize, coco-yam, potato, groundnut, rice, tomatoes etc. the flooding of the bank of the river Omabala and other lakes create a natural manure for cultivation. Also the presence of the river Omabala, stream and lakes give the town big opportunity to fish along them. Also there are ponds owned by families and individuals from where people fish. Ovo is a symbol of authority, justice and power. Ovo could be a tangible material or a non-tangible material. Thus Idigo, A.C. remarks, Ofo is a stick handed to a king or a leader as a staff of office. It is given to who ever is to possess it with much ceremony, which depicts the collective trust and confidence of the entire group or town being placed at the disposal of one individual. Whoever is to handle it must be a respected man who enjoys a commanding influence in the town. Ofo is an ancestral symbol of truth and justice. No meaningful ceremony takes place without Ovo, be it in Christian circle or in civil society. Before a Bishop is to serve the people of God, he is given a staff (Crozier) Mt. 16.16. A president of a nation, a state governor or even a council chairman take oath of office etc. that Crozier and the oath taking are all Ovo. 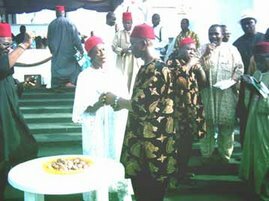 In Igbo traditional setup ovo is consulted before any serious decision is made. This explains why no Nri man could be crowned Eze without coming to Aguleri to make consultations and find out if he is the right person, after which Aguleri hands the Ovo which Eri left to the care of Agulu to such a person, he goes home happily and becomes the Eze of Nri. The present Eze of Nri did it. Like I said earlier Ovo could be spiritual and not necessarily a stick. Thus Ejizu records that Ofo is the symbol of truth, justice, power of leadership, freedom, prayer that reaches God’s ear, reserved power for man and strength in kinsmen. Thus when an Igbo man says “Ejikwe m Ovo” it means that he has said all the truth, he is innocent. He has no power therefore God becomes his strength. In this case ovo becomes a total surrender to a superior power. Ovo like I said is a symbol of truth, authority, dependence etc. When Eri had settled in the present day Aguleri, he built an altar within his camp in Eri-aka. The altar was where he went often to say thanks to Jahweh the God of his fathers. Before he died, he instructed his sons who were under the headship of Agulu to erect another altar. His instruction was like that of Jesus Christ. The sons built a temple called Obuga in honour of their grandfather. He also handed to his first son Agulu the staff of authority, which was kept in Obuga thus the origin of ovo in Igboland. Today, the people of Aguleri go to Obuga for a very serious meeting, where it is believed that the ovo lies and at such meetings, one must speak with the Ojii in one’s hand. The Ojii stands as the visible Ovo and would strike one who tells lies at Obuga. So Agulu inherited the Ovo from his father Eri. There are numerous kinds of ovo, but I will mention here the best known and most used in Igboland. Some Ovo are tangible while some are not. Some have other things that stand for them for instance the Ojii is a visible sign of the non-tangible Ovo. This came into existence by nature. It belongs to the tangible Ovo family. It’s component are the Ovo tree (Osisi Ovo). Here Ogilisi, Anunuebe and Ogbu trees come to mind. This is a non-tangible Ovo. This Ovo is owned by every society, institutions, and communities. This is the Ovo that Christ handed to the Apostles through Peter. The progenitor of the Igbo race Eri handed this Ovo to Agulu the first son. It is this very ovo that the people of Nri come to Aguleri their ancestral home to collect before any Eze. Onyedeve, Nwaezeopala, Chizor who was crowed in 1820 and finally Ekwuo who was crowed as a rival king to Chizor. After the mysterious death of the last two Eze in 1880 the Ovo was kept at the Obuga. Aguleri people reverted to governance by Ndichie (council of elders). This form of rulership lasted for years until the rise to power by Onyekomolo Idigo 1840-1910). The European encroachment on the Niger, the military aggression that resulted from the bid of the then Royal Niger company to expand its operations and the activities of the Christian missionaries not only helped to consolidate the reign of Ogbuanyinya Idigo as the natural leader of Aguleri but extended his power and influence to far and beyond. On the death of Ogbuanyinya Idigo, the elders of Aguleri resolved in consideration of his enormous contributions to Aguleri, to crown one of his children as the Eze of Aguleri, thus Nwanne (1900-1910), one of his sons was presented with the Ovo-eze in accordance with Aguleri tradition. Thus he became Eze Idigo I. After the demise of Eze Nwanne, Raphael Anakwuba Idigo (1910-1960) was given the ovo as Eze Idigo II. When he died, the people of Aguleri handed the Ovo to Eze Alphonsus Ezeudu Idigo (1960-1995) finally Eze C.N. Idigo R. (1995 till date) was enthroned. This Ovo varies from one community to another. The holder of this usually is a chief priest to a deity. So each community can have as many Ovo Alusi as there are deities in the community. This is the Ovo that is owned by a family both extended and nuclear families. The Ovo is usually under the custody of the eldest man of the family. Family meetings are held in the man’s house hence the Ovo dwells there. Again it is believed that the eldest man communes with the ancestors. This family Ovo is the staff of office of the eldest man. This Ovo unlike in some parts of Igboland where institutional Ovo is bought, family Ovo is not bought, it is rather hereditary. At the death of the family head who was the holder of the family Ovo, the next in rank takes over. Thus Metuh remarks, nobody can posses an Ofo in the life time of his master. Here, ovo is personified. In this case, a person becomes an Ovo for the community. He must be the oldest man in the community. This is common in Aguleri. When such a person joins his ancestors, the next oldest becomes the Ovo. His longevity is seen as God’s blessing. People go to him for oral history, narrations, etc. In Aguleri today, Ogbuanyinya Anago Akwuobi born in 1907 is the Ovo Obodo. 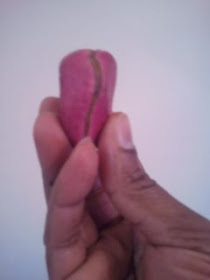 He prays over kola-nut in any gathering of the people. He is seen as being very close to the ancestors. His words in any matter are final. He is called Okpala Aguleri. The holder of an Ovo is the eyes of the gods in African traditional religion and must be consulted before any major decision is taken. For instance the Ovo Obodo Aguleri, and the custodian of Ibobo must be consulted before any war is embarked upon by Aguleri people. In the Catholic Church, the lay consults the Priest who in turn consults the bishop who consults the Pope. These are all Ovo in different guises. Thus Ejizu remarks, Ofo serves in most religious contexts as medium of communication with the transcendent. It means that ovo signifies in religion the relationship between man here on earth and the unseen powers. Ovo is also used in covenant (Igba ndu). Covenant is an undertaking between two or more persons so that nobody is afraid of the other. The people in question stretch their hands towards the Ovo and say whatever they agree upon. In socio-ethical contexts, Nwaorgu remarks, Ofo is used as sacred sanction in all important meetings of a group attesting to the truth affirming one’s innocence and sincerity, punishment of offending members of the group through cursing, denial of rights, ostracizing and expulsion, coronation of Ezes, Ozors etc. Traditional naming ceremony, covenant, relationships including marriage, settlement of disputes and determination of age seniority and community leadership. As a matter of fact, Nwaorgu gave a wonderful resume on the uses of ovo. It means that Ofo serves as a multi-purpose symbol. Ovo on the political role serves as a mandate for leadership, it empowers a person above others. One can then be authorized to make promulgation of liturgical and agricultural seasons as well as major events of the year. Here one thing that comes to mind is the Isato Umuekete’s proclamations. To tackle the issue of the position of Aguleri in Igboland, I have to state opinions of some people. Lawrence Emeka in the Ikoro Bulletin of the Habsberry Institute of African studies of University of Nigeria remarks: “Eri came paddling his canoe down River omambala (now called River Anambra) and settled at Eri-aka, near a tributary of the Omambala known as Odanduli. Eri’s first wife or elder wife, Nono gave birth to several children and the number of their children increased and multiplied, of these children many are founders of towns and progenitors of people. Agulu, the first-born who by custom stayed in his father’s house and inherited his fathers estate and shrines on his death. Menri, a great hunter to whom Eri taught this mystical sciences”. In the words of Ogbuefi Enemmou from Nri on Radio Nigeria Enugu on July 13, 1996, he said “we have a tradition in our place Nri, about a man called Eri who fell down from heaven. He was later known and addressed by the title Igwe. We have also a written record that Eri lived during the period of the fifth pharaoh. In the process of time Eri, a contemporary of Moses migrated with some people across the Nile into Sudan. They proceeded southward until they came and settled at the meeting place of Anambra and Niger Rivers. Nri, he concluded is the head of Igboland, holding the staff of authority, popularly known as Ofo. Dr. Ujah, C. from Arochukwu in his own view remarks. “Eri led a troop down through Eri-aka in Aguleri which overspread to the present Ibo kingdom in Nigeria. Eri brought the Hebrew language down to Nigeria which although had been tinkered with by the neighbours-Yourbas, Edos, Allookoos, Kwas, Ifuris and pygmies. Therefore Eri is the ancestor of all Ibos. Aguleri the first settlement of Eri, thus automatically becomes the holy land. Jerusalem, Mecca and Cradle of Iboland undisputedly. I grew up to know and think that Arochukwu as the alma mater of Ibo race in Nigeria. How wrong I am now. People also are propping up Nri and Igbo-Ukwu, how wrong they are too. Now, Aro, Nri and Igbo-Ukwu blossomed far above Aguleri. Oh yes, Oyo and Benin Kingdoms did likewise far above IIe-Ife. Yet all Yourba lands are pointing to IIe-Ife as the source. Let us start to point to Aguleri as our own IIe-Ife. These are the Eri and Aguleri factors in the equation of history in the Hebrew (Ibo) land of Nigeria Aguleri is it. Having seen different views, I have to state what I know. Eri had long period of migration from East, he settled at Eri-aka in Aguleri near Odanduli between Ivite and Igboezunu all in Aguleri. He had six sons, namely: Agulu who was the first, he stayed back at the father’s Obu (palace) as custom demands. He added his surname to his given thus the birth of Aguleri as a town. Aguleri became the first community in Igboland. His words became the law. His brothers migrated to find communities. Nri left Aguleri in the 9th century to the present Nri town. When Eri died, all his children buried him at Aguleri. The Ogilisi that identifies his tomb is there till date. From the names of important deities in Aguleri, other Igbo communities took theirs like Udo, Idemili etc. Aguleri retains the Ovo Ndigbo till date. We saw in this chapter when Ogbuefi Enemmuo opened his mouth to tell the world that Nri is the head of Igbo nation and that Ovo is in Nri. He forgot that no man can be crowned Eze in Nri without making a spiritual journey which ends in Aguleri where he consults with the important deities, makes sacrifices and collect the ovo (Ududueze) before going back to Nri land. Even the present eze of Nri came to Aguleri for the same purpose. As the first and the head of the Igbo nation, Aguleri has produced Fr. Tansi the first saint in the making in West Africa. Late Idigo G. was the first Igbo editor of the Daily Times and the first African to win a common wealth prize in journalism in 1954 Col. Ivenso, M.C.O. was the first indigenous adjutant general of the Nigeria Army and the first Aide Camp to the governor general of the first president of Nigeria. Idigo M.C.M. was the first Nigerian to hold the post of chief accountant general of the Nigeria Railway Co-operation etc. The fact that all informed historians point to Eri-aka as the settlement of Eri who is generally accepted as the father of the Igbo nation, and not Nri-oka as some un-informed hold. However, I am at the same time challenging and body doubting to go to Aguleri, you will see both Odandulu and Eri-aka. Another serious point is the fact that Eri died in Aguleri. His tomb is there till date. Aguleri community built a primary school called Eri primary school Aguleri to immortalize their great grand father’s name. Nri people come to Aguleri to collect ovo for them to crown their Eze. I thereby conclude that Aguleri is the original home of Ndigbo and that the Ovo Ndigbo is in Aguleri. Ejizu C, Igbo Ritual Symbol, Fourth Dimension, Enugu, 1986. Ezeala J.O.L. Can the igboman be a Christian in view of the Osu caste system? B.I. Nnaji & Sons Press, Orlu, 1991. Ezekwugo, C.M. Philosophical Concepts, Esotericism, + Religiosity + Metaphysics + the Stolen legacy of African heritage, Agatha series Publications Ltd, Enugu, 1992. Idigo, A.C. Oji cola Acuminata-Oji Igbo the Cornerstone of Igbo traditional Ceremonies, Snaap press Enugu, 2002. Idigo F>C. Eri Kingdom of an Igbo king from Israel, x-pose Communications, Lagos 2001. Idigo, M.C.M. Aguleri History and Culture 2nd ed. Bantam Press, Lagos, 1990. Ijoma J.O. (Ed), Building on the Debris of a great Past, proceeding of the first ALL-ARO National Conference, 1996. Fourth Dimension Publishers 1998. Ikeanyibe U, The quest for the origin of Igbo People Aikmay Nig. Ltd. Lagos, 1997. Metuh. E.I. African Religion in Western Conceptual Schemes: The problem of Interpretation. IMICO Press, Jos, 1991. Nwaikwu, A. “Owu” Celebration and Christian worship, Selona Eddysol Publications, Abuja, 2002. Nwoga, D.I. The supreme God as stange in Igbo Religion Thought, Hork Press, Ekwereazu, 1984. Nwaorgu, A.E. Cultural symbols: The Christian perspective (les symbols culturals: La perspective du Christiansme. T’ Afrique international Association, Owerri, 2001..
Onwubiko, O.A. Christian Mission & Culture in Africa. N.3. Facing the Osu issue in the African Synod (A personal response). Snaap Press ltd., Enugu, 1993. Onwuejeogwu, A.M. An Igbo civilization: Nri kingdom and Hegemony, Ethnographica-London, 1981. Ikoro, Bulletin of the Hansberry Institute of African Studies, University of Nig. Nsukka vol. VI No. 2 July, 1985. Ikolo-Magazine of Aguleri the Ancestral home of Ndigbo Vol. 1 No 2 Jan. 2004. Ovala Aguleri 2002 Udo na Njiko Aguleri Jan. 3rd – 7th, 2002. Celebrating 100 years of Idigo Dynasty 1900-2000. Thanks For Your Write Up, Thats a good document, but I didnt give a better clear History about the ezeship Institution in Aguleri. You Know the Truth, but you are hiding from it. Let me tell you the Only Eze we have in Aguleri in the person of HRM EZE A.E Chukwuemeka Eri "Ezeora XXXIV" Enugu Aguleri. i echo my voice to that of CHIENEDU , saying that "you hide the truth about Ezeship in AGULUERI"
I appreciated the fact that some of us knows the truth. EZE A.E Chukwuemeka Eri "Ezeora XXXIV" Is known as the only Eze in Aguleri. Although, i hope to step up when i grow O.L.D. I ask the Lord to bless you, as I pray for you today; to guide you and protect you, as you go along your way. God's love is always with you, God's promises are true. And when you give God all your cares, you know God will see you through. Pass this along to People you want God to Bless - I just did! The Only Way To Resolve Peace In Aguleri is to revert the Eze-Ship Dynasty back to Umuezeora Royal Family in the Hand of Hrm Eze A.E Chukwuemeka-Eri *Eze Eri* as it was the family that was ruling in the 80's & 90's or the dispute between Eze-Eri and Igwe Idigo be Settled. I enjoyed the article until it got to the Jewish rubbish. the worst thing that can happen to an elder is hiding the truth from his younger ones that looks up to him for history. Well, am very happy to be an agulerian,why because is a great land in igbo region and again this Ovala festival has become a great thing that is ever happening in aguleri today which was most greatest thing that will ever make us more great then others in igbo land. Therefore i must put my support by congregating the organizers that ever make it to happened at the every end of years. Thank you all for yours superior effort to ensure that it always be done. I read some comment hereby, and could not believe that someone would come over to internet and would want to inform all, that Agulerians are just two regions namely igboezunu and ivite, that is to awful and awkwardly attitude ... and to be sincere with all, I am desperately not very happy for those comments not well made because that would, may, could cause a hazardous disunity with the unborn Agulerian and this, so much put me in shame for our people that had the guts to lay that kind of comment. In addition, my advise would be that, please all should learn to praise and appreciate his or her place such as a good living place like AGULERI. The world need to know the peace we have in us, and would like to emulate us as PEACEMAKERS, because we have peace in us. Moreover, You and I need to teach our children the right thing because our fore fathers that made up the Aguleri you and I is seeing and living in today, they did not classify AGULERI as one or two make up of Aguleri ok...For me, i say we are ONE and one Love will surely lead us together. RESIDING AT COTONOU IN BENIN REP.
SS3 AND WRITING WEAC AND JAMB. PLEASE CALL ME ON +22998631733. I did not know that there was a history of Aguleri. This is a GREAT job man. I am very happy for what you've done. aWhen was the shrine Obu Uga changed to Obu Gad and why?